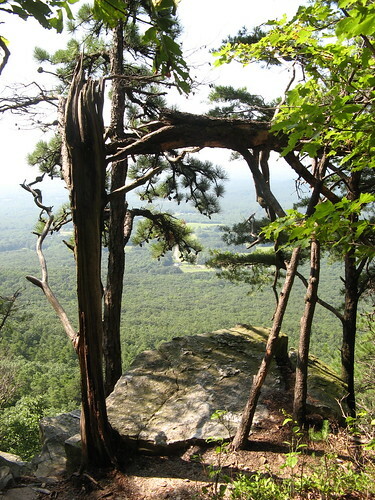 I’m warming to this idea: at least one sweltering outing a year at the top of Pilot Mountain, just to test the principle that there’s no bad time to hike up there. 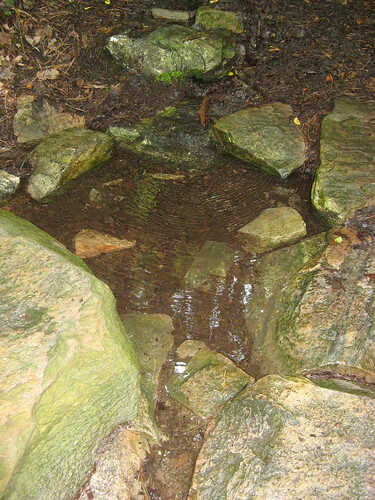 I finished a sweat-drenched wretch on Sunday just as I did 11 months ago, when I made my inaugural North Carolina hike at the Great Stone Teat of the Triad. Now I’m all for trying it again — in another 11 months. 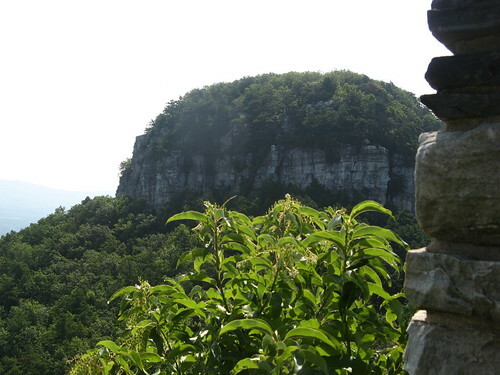 There’s barely more than 3.5 miles of trail atop Pilot Mountain, and you can’t even go to the true summit, aka Big Pinnacle — it’s essentially a bird sanctuary. 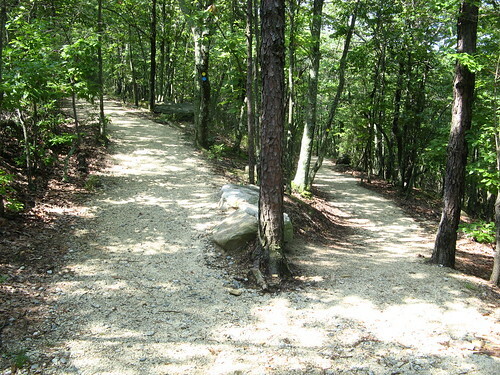 None of the trails are exactly easy; even the shortest is steep and jagged enough for a “moderate” rating. Then there’s the Ledge Spring Loop, a cliff-hugging, stair-stepping trail that introduced me to the concept of a 2.2-mile “strenuous” hike, as abundant in North Carolina as it is non-existent in the Bay Area. You hear your heartbeat on this one. I went out Sunday thinking I’d give the summit a once-over before devoting an EveryTrail Guide to it. As much as the Guides create the theoretical possibility of being paid to hike, the reality is there are chores involved: reading interpretive panels, remembering key turns, etc. Just ask my wife: I hike to avoid chores. 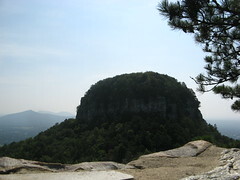 That’s Pilot Mountain’s Big Pinnacle behind Sauratown Mountain. 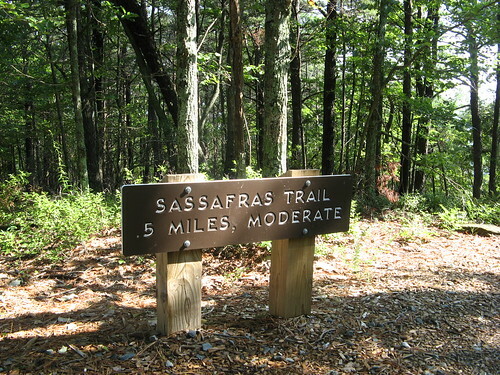 And as we all know, the Sauratown Trail connects the two. (Now, we should all hold hands and sing a Peter, Paul and Mary song in memory of this moment of connectedness). OK, on down the trail. 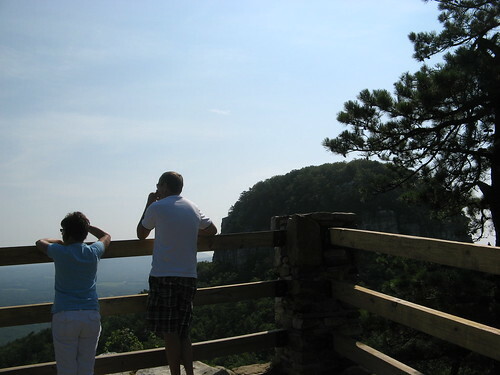 The must-visit point near the summit is Little Pinnacle Overlook, which has visas galore. Next up: Ledge Spring Trail. I took the most direct route, back down to the parking lot. Lots of little footpaths go right up to the edge of the cliffs — the only place where rock climbing is allowed. 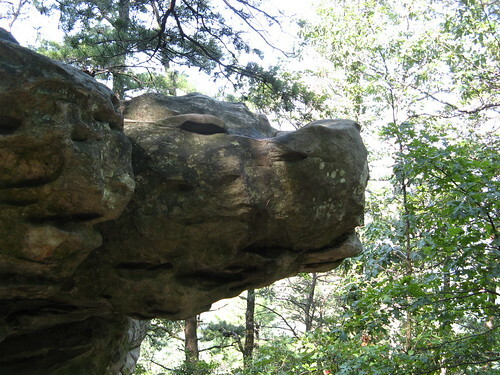 Tell me this rock doesn’t look like a dog’s head. Ledge Spring Trail is a long, pretty steep descent when you start out from the parking lot. 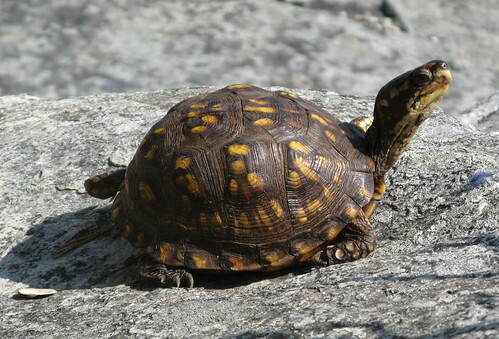 It comes to a big elbow at the intersection with the Grindstone Trail and hangs a sharp left. From here there’s 500 feet of elevation gain in a mile, mostly in the form of stair steps made from old stone. I had to stop and rest a half-dozen times along this stretch, but I still couldn’t help thinking if you have to climb, the climb should be interesting. I’d go this way next time. I presume this is Ledge Spring. 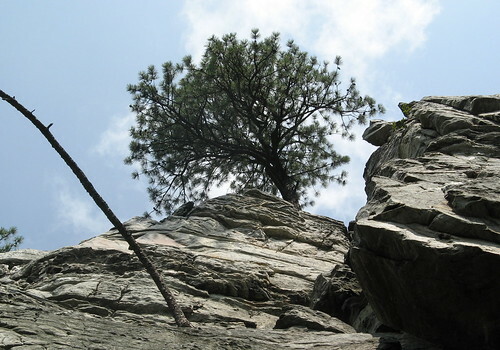 One of many climbers bravely emerging from the forest shade to bake on a sheer cliff. Most of the best shots are looking straight up. Eventually this trail ends at the Jameokee Trail, a .8 mile loop around the shoulder of Big Pinnacle. It’s nice hiking, but tends to get crowded. Big Pinnacle has awesome cliffs. 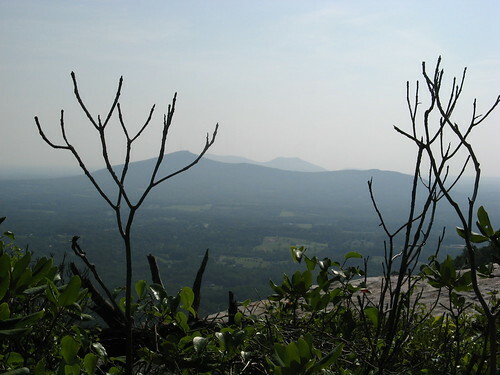 After almost a year’s worth of hikes in the Triad, the Blue Ridge and beyond, I was a bit surprised how well Pilot Mountain’s summit trails stack up. 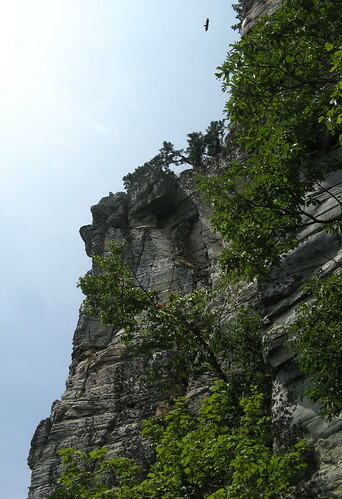 The hiking’s quite good, though it might leave you wishing for a third pinnacle. 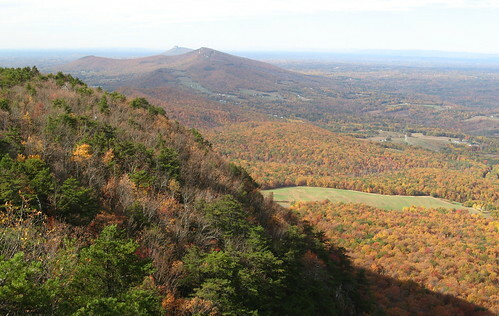 I hiked all of the trails in both Hanging Rock and Pilot Mtn. Then just to finish them off I hiked the Sauratown Tail. Its not a hard hike nor is that long but its bridle trail the whole way and man did my feet hate me. If for no other reason, it is part of the MST (Mountain to Sea Trail) so I had to hike it for my section hike either way. Great photos and maybe Ill see you on one of these trails one day. I imagine you’d pass me like I’m standing still — I’ll be the one bent over my hiking pole, waiting for my heartbeat to fall back out of the red. I’ve done half the Sauratown Trail — I’m waiting for them to reroute one section before I do the rest. 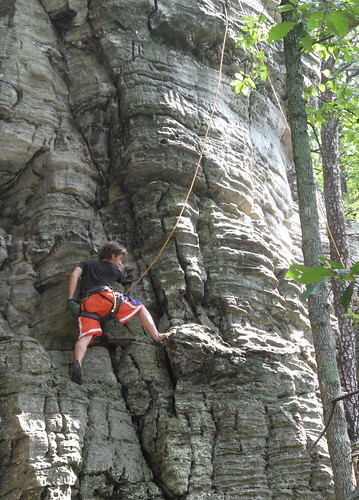 I think there’s only about a mile or so of Hanging Rock that I haven’t done, over at Cook’s Wall. Have you done Moore’s Wall from the Tory’s Den trailhead? It’s a much more pleasant route in — few if any people and a gentler hike to the top. I thought that rock looked like a dragon head before I read your comment… after reading it, you’re right, definitely looks like a dog head. Interesting lesson in photo cropping in that picture: import a copy into your image editing software and see what happens if you crop in close around the rocks and cut most of the trees out: the image of the dog pretty much disappears. It needs the contrast of the trees to frame the shot and make the pooch head pop out. I have done a lot of hiking in NC’s Smokies and Blue Ridge, but never in its mountains that are so far east. 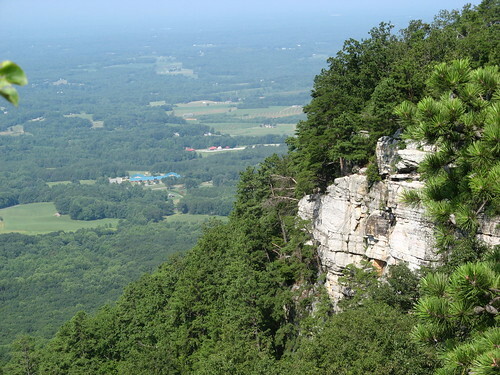 Now, after reading this post, I absolutely want to hike up Pilot Mountain. Does anyone know of a site that shows staircase going up big pinnacle before it was torn down?